U.S. Sen. Chuck Grassley (R-IA), Chairman of the Senate Judiciary Committee, today introduced the Accountability Through Electronic Verification Act of 2015 that would permanently authorize and require employers to use the E-Verify program, an Internet-based system that assists employers in determining the eligibility of employees to work in the United States. “E-Verify has already proven to be a cost-free, successful tool for the companies that volunteer to use it. The program assists businesses that want to comply with immigration laws, safeguards opportunities for legal workers, and helps to reduce incentives for illegal entry into the United States. Enhancing it and making it a staple in every workplace will help in holding businesses accountable. 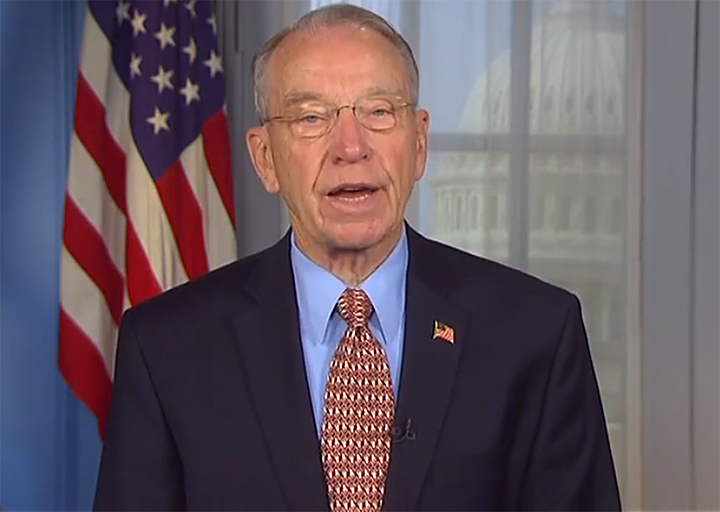 As Congress considers the reauthorization of E-Verify this year, this bill should be a starting point for discussion,” Grassley said. Currently, employers voluntarily submit information reported on an employee’s Form I-9 to the Department of Homeland Security through the E-Verify system, which works in partnership with the Social Security Administration to determine worker eligibility. There is no cost for employers to use E-Verify. E-Verify was established in 1996 as a pilot program with employers in five states allowed to participate. The pilot program was reauthorized in 2001, expanded to employers in every state in 2003 under Grassley-authored legislation, and reauthorized again in 2008, 2009 and 2012. The program is due for reauthorization this year. • Permanently reauthorizes the E-Verify program that was created in 1996. • Makes the program mandatory for all employers within one year of date of enactment, requires federal contractors and agencies to use the program immediately, and directs “critical employers,” as identified by the Secretary of Homeland Security, to use the system within 30 days of designation. • Increases penalties for employers who illegally hire undocumented workers. • Reduces the liability that employers face if they participate in E-Verify when it involves the wrongful termination of an individual. • Allows employers to use E-Verify before a person is hired. • Requires employers to check the status of all current employees within 3 years. • Requires employers to terminate the employment of those found unauthorized to work due to a check through E-Verify. • Helps ensure that the Social Security Administration catches multiple uses of Social Security numbers by requiring them to develop algorithms to detect anomalies. • Establishes a demonstration project in a rural area or area without internet capabilities to assist small businesses in complying with the participation requirement. • Amends the criminal code to make clear that defendants who possess or otherwise use identity information not their own without lawful authority and in the commission of another felony is still punishable for aggravated identity fraud, regardless of the defendant’s “knowledge” of the victim. • Requires employers to re-verify an employee’s immigration status if the employment authorization is due to expire. The Accountability Through Electronic Verification Act of 2015 is cosponsored by Senators Mike Lee, David Vitter, Mike Enzi, Deb Fischer, Bob Corker, Tom Cotton, Jim Inhofe, Jeff Sessions, Shelly Moore Capito, John Boozman, David Perdue, and Roger Wicker.